One goal of the $800-plus billion economic stimulus package is to give Americans a lift, a sense that Uncle Sam has a solution to today’s economic woes. But will the plan provide a break from the steady onslaught of gloom – from a dizzy stock market to continuing problems of the big banks? Will it give people confidence to buy new cars or perhaps just splurge a little? Some public opinion seers suggest it might help, perhaps showing that the new president and Congress can accomplish something. Other poll watchers, though, caution that the public has low expectations, with a large number of people feeling the package won’t have much effect on them. “It might be less than you hoped but better than nothing,” says Dennis Jacobe, chief economist at the Gallup Organization. 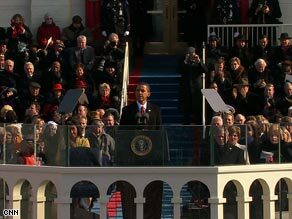 But pollster John Zogby says once President Obama signs the stimulus package, it can be viewed as action. “The bottom line is Americans are looking for the president and Congress to get together and make something happen, and the action part is greater than the specifics,” says Mr. Zogby, president and CEO of Zogby International. The most recent Gallup numbers certainly show the public has modest expectations. Only 12 percent think it will make the economy “a lot better,” and 32 percent believe it will make it “a little better.” However, 41 percent think it will have no effect and 12 percent think it will be worse. “There can be some psychological effect but how long it can last is another issue,” says Mr. Jacobe. Mr. Obama realizes he needs to build support for the massive bill. That’s one of the reasons he held a prime-time press conference on Monday evening to make his case for his approach and will travel Thursday to Peoria, Ill., after town hall meetings in Fort Myers, Fla., and Elkhart, Ind., earlier this week. Jacobe says one of the problems for Obama is that to spur lawmakers he has had to talk about the depressed state of the economy. For example, in December, as president-elect he warned Americans that the economic news was going to get worse before it gets better. “It’s really tough to get confidence in the future when you are dropping 150,000 jobs a week,” says Jacobe. Unemployment could be worse than now by the time President-elect Barack Obama’s first term ends. And with good reason: The picture isn’t pretty. The prospects are so gloomy, according to a recent study, that unemployment may be slightly higher by the time President-elect Barack Obama’s first term ends. The damage done by plunging house and stock prices, the failure of other major economies to be independent sources of growth and hidden weaknesses in America’s past performance have crippled nearly every actor in the nation’s economic drama. None — save perhaps the government — retains the power to push the economy back to speeds it regularly achieved during much of the last generation, economists say. The result: An economy that once averaged 3% or better annual growth would be lucky to grow 2% a year during the entirety of the new president’s term. “That is going to feel like stagnation” to most people, said John Lonski, chief economist at Moody’s Investors Service.